BPD is asking for the public's help in identifying a woman they say was involved in a strongarm robbery at the Marshalls in South Bakersfield. According to BPD, on October 15, a woman entered into the Marshalls located at 3008 Ming Avenue where she selected and concealed several items of value. The suspect attempted to exit without paying for the items and was confronted by an employee. BPD says the suspect then assaulted the employee and fled from the store. The suspect is described as a Hispanic female, 25 to 30 years old, approximately 5 ft. 2 inches and 130 pounds, slim build, with brown hair and brown eyes. 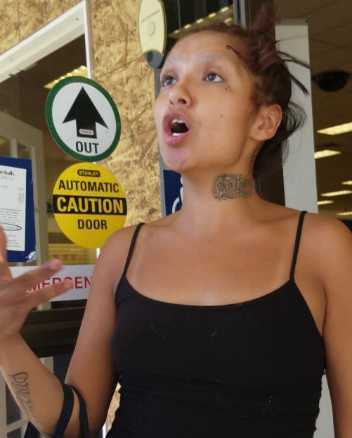 The suspect has 'Antony' tattooed on the left side of her neck, three dots tattooed near her left eye, and 'Raiders' tattooed on her right forearm. Anyone with information regarding this investigation is asked to call Detective D. Jordan at (661) 326-3872 or the Bakersfield Police Department at (661) 327-7111.